NEED HELP??? If you get stuck, contact Parallax Tech Support: email support@parallax.com, or call 888-997-8267 (USA only) or 916-624-8333. 8-5 M-F. Pacific Time. The BlocklyProp FAQ for Schools  may also be of help installing BlocklyProp. See the Scribbler 3 Robot Block Reference . Most blocks are specific to the Scribbler S3 robot, so it has its own reference . Updated the BlocklyProp core provided by Google, to fix a core bug related to variables. This slightly changed the process for creating variables. See the Variable Blocks  tutorial. 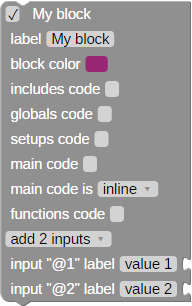 Updated Robot blocks to support the ActivityBot 360° robot  in the Robotics with Blockly  tutorial. BlocklyProp website , BlocklyProp server , BlocklyProp client , Propeller Cloud Compiler . BlocklyProp has two categories of operators: numbers that work with numerical values, and strings that work with text characters. Compatible with all Propeller board types (except Scribbler Robot). The NUMBER operator blocks can accept number value blocks, and any other operation blocks or sensor blocks that provide a numerical value. The math operation block has two terms by default. Click the gear and drag over additional terms as needed. THE LIMIT IS 26 TERMS. Raising to a power - use nested operations to raise a power to a power or you may get unexpected results. Switch to the code view to verify that the operations performed on the terms are what you expect. To change the order of operations, nest operation blocks inside each other, and/or use the Parentheses block (below). The limit block allows you to compare the inserted values, and use the highest or lowest value as chosen in the dropdown menu. The constrain block prevents a value from being too large or too small before using it. Insert a value or variable item, and then enter the maximum and minimum values for the range you want that value to stay within before it is used. The de/increment block increases (increment) or decreases (decrement) the variable attached to it by 1. The random block provides a random number between the first inserted low value and the second inserted high value. The first number must be smaller than the second number. If they are not in that order, the resulting random value may be unexpected, such as a number outside the range specified. The bitwise block performs a bitwise operation (& AND, | OR, ^ XOR, >> right shift, << left shift) on the two values inserted. The boolean comparison block performs a boolean comparison between the two inserted values and provides a 1/true or 0/false depending on the option selected (and, or, and not, or not). negate: provide the signed value complement; for example, negate 9 provides -9). The parentheses block surrounds the enclosed block(s) with parentheses. Use parentheses to change the order of operations in a series of blocks. The map value block scales and offsets the inserted value from the first defined range to the second defined range. This block does not constrain the value that you've entered. For example, given the ranges as shown in the block above, if the value you enter is -5, it will output -10, because the block is asking the new range to be twice the original range. Since Blockly is working only with integer math, the block requires you to begin with a multiplier (the first inserted value). Although you could use 1 here, larger numbers make this block more precise. Because inverse trigonometry operations usually are done on ratios (one number divided by another, the block requires you to input both the numerator and denominator of the ratio. If you need the inverse trig operation of a single number, use 1 as the denominator (the second number). Several string operator blocks have older versions that have been depricated, and if your project contains any of these older blocks, they will appear orange in color. While they will still work, it is a good idea to replace those blocks with newer versions and adjust your code accordingly. Most of the depricated blocks were depricated because they treated strings of text as one-referenced entities (One-referencing is where the first character of a string of text would be counted as character number 1. Zero-referencing is where the first character would be counted as character zero). While one-referecing is easier to understand, it wasn't fully compatible with other blocks and code since C is a zero-referenced language. Never versions of those blocks are all zero-referenced. The string variable set size block is used to increase or decrease the size of the variable that can hold strings of text. By default, string variables are set to hold up to 64 characters. By decreasing the size of your string variables, you can save memory. By increasing the size of your string variables, you can hold longer strings of text. Use the gear icon to add additional variables to the list, and set the size of each variable accordingly. If you've defined a constant using the constant define block, you can set the size of your variable to that defined constant when you click on the gear icon. The alphabetical comparisons are only alphabetical if the case matches - a capital “A” sorts differently than a lowercase “a”. The length of string block provides the number of characters in the string, or variable containing a string, inserted into the block. The combine strings block combines the first and second string and stores them in the variable selected in the drop-down menu. The block uses a buffer, so it is safe to use this block to add text to the beginning or end of a string already stored in a variable. The find string location block provides the position of a substring within a larger string. The block gives a number value representing where the starting location of the substring is in the larger string. For example, if you use this block to find the substring “World” in the string “Hello World!”, the block would return 7 because “World” starts at the 7th character in the string. The get character at position block provides the ASCII character  (a number value between 0 and 255) for the character found in the string specified in the drop-down menu at the position set by the number value block. The set character at position block sets the ASCII character  (a number value between 0 and 255) for the character in the string specified in the drop-down menu at the position set by the number value block. The get part of string block stores the part of the string specified by the first drop-down menu from the start and end positions set by the number value blocks and stores it in the variable specified by the second drop-down menu. The split string block is used to split up a string separated by the defined character. Can be used more than once to extract multiple string parts. The trim string block removes extra spaces at the beginning and end of a string of text. The string empty block is used to test if a string is null or empty. The create string block is used for making a new string from attached values or text. Use the gear icon to add additional values such as decimal, hexadecimal, or binary integers, ASCII characters, floating point numbers, or strings of text to the string. The scan string block is used to look for and extract values or characters from a string. Use the gear icon to add types of values to search for and extract from the string such as decimal, hexadecimal, or binary integers, ASCII characters, or floating point numbers. The string to number block converts the inserted string from decimal, hexadecimal, or binary format into an integer number, then stores the number in the chosen item. This block has been deprecated. Its functionality is now in the scan string block. The number to string block converts the inserted integer value into a string in decimal, hexadecimal, or binary format, and then stores the string in the chosen item. This block has been deprecated. Its functionality is now in the create string block. Type in a name for your array variable (see About Naming Things  for the rules.) The default name is "list." All other blocks using your new array must have the name typed in exactly the same. Type in the number of elements your array will contain. Now, your array variable will be accessible from any other array block that has the same name typed into it, such as the array get element block below. The array fill block allows you to set multiple elements in your array using a comma-separated list of numbers. All numbers must be integers. Any decimal values will be truncated, and if there are more values typed in than there are elements in the array, it will only fill the available elements. The elements are always filled in order starting with element 0 (zero). The array get element block provides the value of the specified element. The element to retrieve can be specified with either a number value block or any other block that provides a value, such as a get variable block. The array set element block sets the element specified by the first inserted block to the value specified by the second inserted block. The array clear block sets all of the elements in your array to 0 (zero). 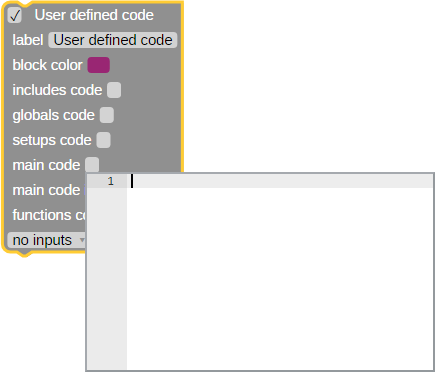 Click the new variable button at the top of the Variables menu, then type in a unique variable name and click OK. See About Naming Things  for the rules. See the Variable Blocks  tutorial for an example activity. Next, give the function a unique name in the my function drop-down menu. See About Naming Things  for the rules. The BADGE DISPLAY blocks work with the black-and-white OLED screen built into the badges. This 128x64 pixel display uses a coordinate grid to define where text, numbers, points, lines, and shapes can be drawn on the screen. The coordinates start at 0 (leftmost column), 0 (top row) and increase to 127 (rightmost column), 63 (bottom row). WARNING: The BADGE DISPLAY blocks can only be used from your main program. These blocks will not work if used inside function blocks that are then launched with the new processor block. The Badge display print number block is used to send numbers to the Badge module. Numbers can be displayed as a decimal, hexadecimal, or binary. The Badge display print text block is used to send text strings to the Badge module. 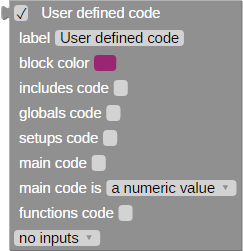 Checking the specify digits block adds a fill-in field next to all attached number values. BlocklyProp uses integer numbers. The floating point number option allows an integer value to be displayed as a decimal number. Use its drop-down menu to divide the integer by a multiple of 10 to scale and display the number appropriately. The specify digits checkbox activates an additional field by each numeric term. The Badge display set font block is used to set the size of the text (i.e., small: 5x7, medium: 11x15, large: 17x23). The Badge display set cursor block moves the cursor to the row and column specified. The display on the The Hackable Electronic Badge and the Badge WX has 128 columns and 64 rows. The cursor position will be the top left pixel where a subsequent block's text string or number will be printed, or where a shape's origin will be. The Badge display clear screen block clears the entire screen by setting all pixels to black. The Badge display rotate block turns the contents of the screen 180°. The Badge display draw point block sets the pixel defined by the first two value blocks to the color defined by the color block. The Badge display draw line block draws a line from the first coordinate to the second coordinate in the color defined by the color block. The Badge display draw rectangle block draws a rectangle from the first coordinate (top left corner of the rectangle) to the second coordinate (bottom right corner of the rectangle) in the color defined by the color block. The "fill" checkbox sets whether the rectangle will be drawn as hollow or filled. The Badge display draw circle block will draw a circle whose center is set by the first two value blocks, and in the color defined by the color block. The "fill" checkbox sets whether the circle will be drawn as hollow or filled. The Badge display draw triangle block draws a triangle from the first coordinate to the second coordinate to the third coordinate in the color defined by the color block. The "fill" checkbox sets whether the triangle will be drawn as hollow or filled. Block availability varies by Badge type. Using any of the Badge RGB-LED blocks on the Badge WX will cause one processor to be launched automatically (one total, NOT one per block). The Badge RGB-LED setup block is used to tell the Propeller how many RGB-LEDs are connected to the Badge WX. The Badge WX has 4 RGB-LEDs built in and a pin available to connect more. The Badge RGB-LED set block is used to specify the color for a specific LED. The Badge RGB-LED set multiple block is used to specify the color for a range of consecutive LEDs. The Badge RGB-LED update block is used to update colors of all connected RGB-LEDs. The Badge LED brightness block sets the brightness of a specified LED. These Badge set LED blocks are used to turn the specified LED on or off. The Badge set RGB-LED block sets the specified RGB-LED to a specified color. unlock: sets the Badge to stay unlocked after being manually unlocked via the Badge WX's own menu, or via 6 quick On/Off button presses, until the power is cycled. lock: prevents the Badge from being programmed until manually unlocked. See the Badge WX Product Guide, under Downloads at the Badge WX product page . For Propeller Activity Board WX (via USB connection only), Hackable Electronic Badge, FLiP, and Other board types. The GRAPH blocks are used to generate a visual graph of data in BlocklyProp's Graphing window. This window will open automatically when you run a project that uses these blocks. Do not try to use Graph and Terminal blocks in the same project. The Terminal takes charge and will prevent the Graphing window from opening. You would, however, see some data values appear in the Terminal window. Do not use the Graph blocks in a function that will be launched with the New Processor block. It won't work - the Graph needs to be used from your project's main processor. See the Graphing Data  page of the Simple BlocklyProp Programs tutorial for an example project that doesn't require any circuits. Watch the YouTube video below to see the Propeller Activity Board WX receive and graph data from an analog sensor. Use the Graph initialize block at the beginning of your project to set the display area for the data that your project will graph. keep selects the minimum number of seconds of the latest data to display in the graph at a time. As the display fills, you may see the horizontal division values change if your project continues to send data for longer than the value you enter here. y-axis selects a vertical scale option from the drop-down. autoscale allows the y-axis to continuously adjust to best fit your data; you may see the vertical division values change as your graph plots. range if selected will provide fields for entering minimum and maximum values. The Graph value block sends the attached value to the graph display. Click the gear to display additional values from the same block; you will be able to label each value. Each value plotted is a different color, with a matching label and numerical data displayed in a box in the Graphing window's upper right corner. Available for Activity Board, FLiP, and Other board types. Not available for Badge or Scribbler Robot board types. I/O pin availability will vary with board type. The 96 x 64 Color OLED display module (#28087)  uses a coordinate grid to define where text, numbers, points, lines, and shapes can be drawn on the display module’s screen. The coordinates start at 0 (leftmost column), 0 (top row) and increase to 95 (rightmost column), 63 (bottom row). See the OLED Display with BlocklyProp tutoria l to get started. WARNING! The OLED blocks can only be used from your main program. These blocks will not work if used inside function blocks that are then launched with the new processor block. The OLED initialize block is used to set up the Color OLED display module. The DIN, CLK, CS, D/C, and RES pins on the module must be matched to the Propeller I/O pins they are connected to. If you forget to use this block in your project, other OLED blocks will display a triangle warning symbol. Click the triangle, and you will see a reminder message to use the OLED initialize block at the beginning of your program. The OLED font loader block must be run as its own program (with no other blocks) before any medium or large fonts can be used. When this block is run, it takes about a minute to load all of the fonts onto the EEPROM memory chip on the Propeller Activity Board. The fonts are stored in EEPROM locations 40576..63400. The OLED max height block returns the vertical value of the bottom row of pixels: 63 when the pins are in a vertical orientation, 95 when the pins are in a horizontal orientation. The OLED max width block returns the horizontal value of the rightmost column of pixels: 95 when the pins are in a vertical orientation, 63 when the pins are in a horizontal orientation. clear screen: clears the entire screen by setting all pixels to black. sleep: turns off the display, while preserving what was drawn on it. wake: takes the display out of sleep mode. invert: Inverts all of the colors on the display. orient pins (up/down/left/right): changes the coordinate system to reflect a different orientaion of the OLED module for any draw commands after this block is used. Does NOT rotate or change anything that has already been drawn to the screen. The OLED font color block is used to set both the color of the font and the background (highlight) color displayed behind the font characters. If the background color is set to the same color as the font color, the background will be made transparent. The OLED set text block is used to set the size (small: 5x7, medium: 11x15, large: 17x23) and the font face (sans/console, serif/typewriter, script/handwriting, bubble/cartoon). The OLED set cursor block sets the top left pixel position where text starts being written. The OLED print text block is used to send text strings to the OLED module. The OLED print number block is used to send numbers to the OLED module. Numbers can be displayed as a decimal, hexadecimal, or binary. The OLED draw pixel block sets the pixel defined by the first two value blocks to the color defined by the color block. The OLED draw line block draws a line from the first coordinate to the second coordinate in the color defined by the color block. The OLED draw triangle block draws a triangle from the first coordinate to the second coordinate to the third coordinate in the color defined by the color block. 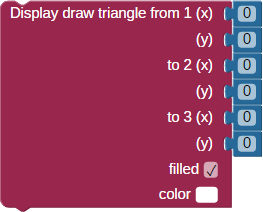 The “fill” checkbox sets whether the triangle will be drawn as hollow or filled. The OLED draw rectangle block draws a rectangle from the first coordinate (top left corner of the rectangle) to the second coordinate (bottom right corner of the rectangle) in the color defined by the color block. The “roundness” value, if set to something other than zero, will round the corners by the amount specified (radius of the roundness). 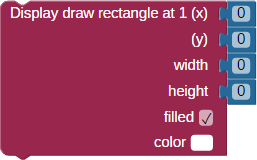 The “fill” checkbox sets whether the rectangle will be drawn as hollow or filled. The OLED draw circle block will draw a circle whose center is set by the first two value blocks, and in the color defined by the color block. The “fill” checkbox sets whether the circle will be drawn as hollow or filled. BlocklyProp supports just one RGB-LED Init block per project, so if you want to use multiple RGB LEDs, chain them together instead of wiring them to separate Propeller I/O pins. These blocks are intended for WS2812B RGB LED modules (Parallax #28025 & 28026 ). This block launches a processor automatically, one per block instance. In the first drop-down field select the Propeller I/O pin connected to the signal input pin of the first RGB LED, in a chain of 1 or more LEDs. In the second field, enter the number of RGB LEDs chained together. In the third drop-down, specify the type of RGB LEDs being used (WS2812 is the only initial option). If you use more than one RGB-LED init block in a project, the RGB-LED set and RBG-LED update blocks will provide a dropdown for selecting the targeted Propeller I/O pin for a given set of RGB-LEDs. The RGB-LED set block allows you to choose a color for a specific RGB LED. In the number field, Insert a number value specifying the location of the target RGB LED in the chain. RGB LED number 1 is the unit directly connected to the Propeller I/O pin. In the color field, insert a color value. Click its window and choose a color* from the pop-up menu. If you are using more than one RGB-LED init block in a project, select the Propeller I/O pin for the target RGB LED(s) from the dropdown that will appear. Use a new block to set the color for each RGB LED in the chain. The settings will not take effect until the program execution reaches an RGB-LED update block. *Keep in mind that with WS2812B LEDs, brightness and current draw will vary by color, with white being the brightest and most power-consuming setting. The RGB-LED set block allows you to choose a color for a specific contiguous range of RGB LEDs chained together. In the first number field, Insert a number value specifying the location of the first target RGB LED in the chain. RGB LED number 1 is the unit directly connected to the Propeller I/O pin. In the second number field, Insert a number value specifying the location of the last target RGB LED in the desired chain. In the color field, insert a color value. Or, click its window and choose a color* from the pop-up menu. The RGB-LED update block updates all of the RGB LED colors to the settings specified in the most recent RGB-LED set blocks. Each time the colors are changed with RGB-LED set blocks, the RGB-LED update block must be used again to see the new colors. If you use more than one RGB-LED init block in a project, the RBG-LED update blocks will provide a dropdown for selecting the targeted Propeller I/O pin for a given set of RGB-LEDs. For Activity Board, FLiP, and Other board types. Not available for Badge or Scribbler Robot board types. I/O pin availability will vary with board type. Use care if accessing I/O pins connected to built-in accessory circuits on your board. Refer to your board's product guide for I/O pin assignment details. The SERIAL LCD blocks are used to set up and send information to be displayed (or played) on Parallax 2x16 (#27976  & #27977 ) and 4x20 (#27979 ) character LCD modules. This block launches a processor automatically. Use only instance of this block per project. PIN must be set to the Propeller I/O pin it is connected to. Options are 0-27; however, I/O pins 18-27 are connected to other circuits on the Propeller Activity Board and should not be used here. The LCD print text block sends the inserted text string to the serial LCD module. The LCD print number block sends the inserted number value to the serial LCD module. Use the dropdown menu to choose how to display the value, as a decimal, hexadecimal, or binary number. The LCD set cursor block sets the position of the cursor on the LCD screen. It can be used to print text or numbers at any location on the screen. The LCD play note block is used to make the Parallax LCD module play a musical note from its onboard piezo speaker. Set the note pitch (or rest) from the first dropdown. Set the octave, 3rd to 7th, in the second dropdown. Set the note duration in the third dropdown, ranging from a whole note (2 seconds) down to a sixty-fourth (31 ms). Available for all board types via a USB connection. Not currently available over WiFi with the Activity Board WX or Badge WX. The TERMINAL blocks are used for displaying text on your computer screen, using BlocklyProp's built-in Terminal. The Terminal will open automatically when you run a project that uses these blocks. Do not try to use Terminal and Graph blocks in the same project. The Terminal takes charge and will prevent the Graphing window from opening. You may, however, see some data values appear in the Terminal window. The Terminal print number block sends the inserted value to the Terminal window. Set the drop-down menu to display the number as a decimal, hexadecimal, or binary. The “then a new line” checkbox, when checked, adds a carriage return to the end of the number that was sent, moving the cursor to the beginning of the next line in the Terminal. The Terminal print multiple block can print several terms of different types on a single line. When checked, the "then a new line” checkbox adds a carriage return to the end of the text that was sent, moving the cursor to the beginning of the next line in the Terminal. BlocklyProp uses integer numbers. The floating point number option allows an integer value to be displayed as a decimal number. Use its drop-down menu to divide the integer by a multiple of 10 to scale and display the number appropriately. The Terminal receive text block stores any characters typed into the Terminal into the variable item chosen in the drop-down menu. The characters entered, even if they are numbers, are stored as a string. This block will continue to collect up to 128 characters until the user presses the enter key (sends a carriage return character). Program execution will pause until the carriage return character is received. The Terminal receive number block stores numerical characters typed into the Terminal into the variable item chosen in the drop-down. The number entered is stored as an integer. This block will continue to collect numerical characters until the user presses the enter key (sends a carriage return character). Program execution will pause until the carriage return character is received. The Terminal new line block sends a single carriage return character to the Terminal, moving the cursor to the beginning of the next line. The Terminal clear screen block sends a special character to the screen, which causes the Terminal to clear and reset the cursor to the top left (0,0) position. The Terminal set cursor block positions the cursor in the window. First, use a Terminal clear screen block, which also places the cursor in the top-left 0, 0 positions. Insert a number value to the desired row. Insert a number value to the desired column, 0 to 255. The Terminal close block closes the Simple Terminal object so that pins 30 and 31 can be used for other purposes such as a full-duplex serial connection. UNDER CONSTRUCTION! 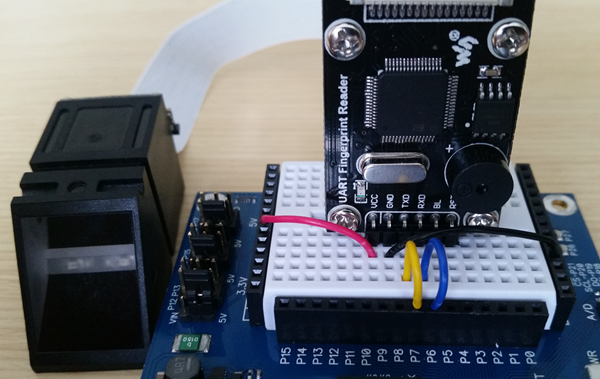 BlocklyProp reference for using Parallax WX ESP8266 WiFi Module communication blocks. Compatible with the Activity Board WX, FLiP, Badge WX, and Other board types only. 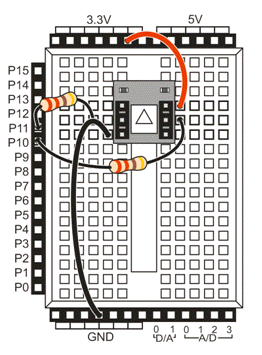 DIP : Two rows of legs underneath plug into a socket on your Propeller Activity Board WX. SIP : One row of legs at the bottom plug into a breadboard. UNDER CONSTRUCTION!! These blocks are under development and not yet available on our production Blocklyprop tool. These blocks work with XBee 802.15.4 (series 1) RF modules . For any XBee model, you may also use the Serial Initialize, Serial transmit, and Serial receive  blocks for direct asynchronous serial communication. These blocks are for Parallax's 2-Axis Joystick (#27800)  used only with the A/D converter built into the Propeller Activity Board (original or WX). New to this sensor? 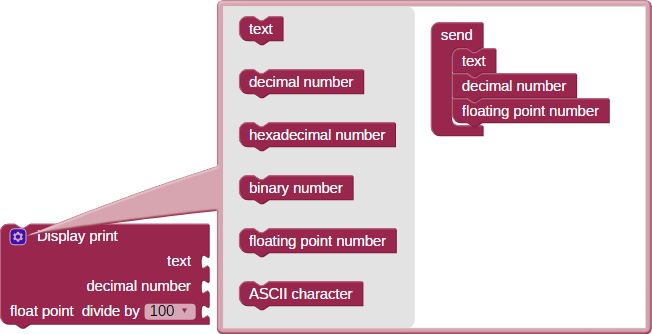 Click here to see an example schematic and quick Blockly program  to help you get started. 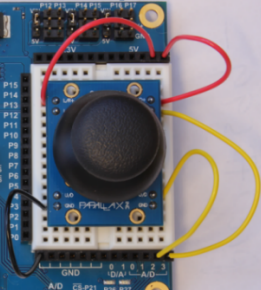 The Parallax 2-Axis Joystick can be used for a wide variety of projects like wheeled robots, video games, or anything requiring user input. The Propeller Activity Board's A/D converter reads the joystick's output on each axis. Using the connections shown in the wiring diagram above, this program will show you Joystick Up/Down and Left/Right position values (0-99) in the Terminal. For Propeller Activity Board WX, FLiP and Other board types. Not available for Badge or Scribbler Robot board types. These blocks are specifically for the 4 x 4 Matrix Membrane Keypad (#27899)  sold by Parallax. The 4x4 Keypad Initialize block defines the connections between the Keypad's ribbon cable and the Propeller microcontroller's I/O pins. I/O pin availability will vary by board type. If you forget to use this block in your program, a triangle warning icon will appear on other 4 x 4 keypad blocks as a reminder. With the keypad facing you, start matching from the leftmost pin to the rightmost pin. The four rightmost pins MUST be connected to pull-down resistors; use 1 k-ohm to 100 k-ohm resistors for this. The 4x4 Keypad read block provides a number value for the key pressed. No button pressed reads as -1. This example is specifically for the 4 x 4 Matrix Membrane Keypad (#27899)  sold by Parallax. Using the connections shown in the wiring diagram above, this program will show you the number of the key you are pressing on the keypad, in the Terminal, updating once per half-second. The numbers you see should be very stable. If they fluctuate quickly, or if you notice numbers showing up that you did not press, double-check that you have 1 kOhm (or higher) resistors from pins P7-P4 going to ground and that they're firmly in the correct breadboard row and ground holes. See connection image, above. The Badge accelerometer get block returns acceleration and tilt on one of 3 axes (AX, Ay, or AZ) in centigravity units (cg) which is 100ths of 1 gravity (1 g). The Badge accelerometer shaken block checks to see if the accelerometer was shaken within the last half second. The Badge button touchpad block returns the state of the specified rocker or touchpad button - (1) pressed, (0) not pressed. The Badge button block returns the state of the specified rocker or touchpad button - (1) pressed, (0) not pressed. The Badge touch sensitivity block sets the sensitivity of the touchpads (A & B) on the badge. Available for Activity Board, FLiP, and Other board types. Not available for Badge or Scribbler Robot board types. I/O pin range options will vary with board type. From the PIN dropdown, select the Propeller I/O pin number that is connected to the ColorPal module's signal pin. If you use more than one ColorPal initialize block in a project, the other ColorPal blocks will provide a drop-down to select the Propeller I/O pin for your target ColorPal module. The ColorPal raw colors block measures the amount of red, green, and blue it detects. Each of those three raw values is stored in the corresponding variable selected in each drop-down menu. The raw values can range from 0 to 4095. The raw values are not white-balanced, but when used correctly, they can be more accurate than the value provided by the ColorPal get color block. Choose the target variables in which to store the ColorPal output values for the R (red), G (green), and B (blue) components of the sampled color. If you are using more than one ColorPal initialize block in a project, select the Propeller I/O pin for the target ColorPal module from the drop-down that will appear. The ColorPal get color block takes a measurement and provides a single, approximate white-balanced, 24-bit color value that is stored in the variable selected in the drop-down. That variable can then be used with other color value blocks . Choose the target variable in which to store the sampled ColorPal output value. 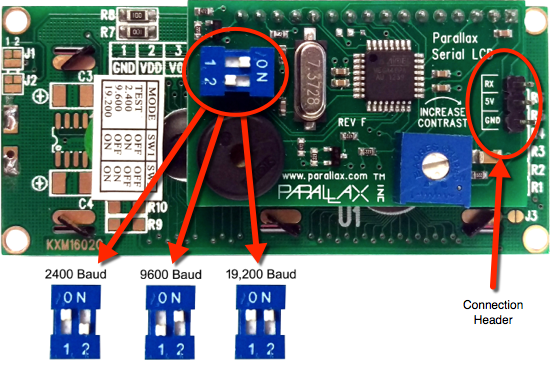 If using a Propeller Activity Board, the ColorPal can be connected to either the breadboard or via a 3-wire extension cable to one of the servo headers P12-P17. Using the connections shown in the wiring diagram above, this example will display the RGB values detected by the ColorPal in the Terminal. Try holding differently-colored objects up to the sensor to see their RGB values. These blocks are for use with the Fingerprint Scanner (#29126)  and the Propeller Activity Board WX, Propeller FLiP or Other board types. Not available for Badge or Scribbler Robot board types. Use the Fingerprint scanner initialize block to specify which Propeller I/O pins are connected to your device. I/O pins available for this use will vary with board type. If you forget to use this block in your project, a triangle warning icon will appear on other Fingerprint scanner blocks as a reminder. capture and save to - capture a fingerprint and save it to your device memory, assigning it the ID number of the inserted number value. delete capture for - delete the captured fingerprint for the specified ID number from device memory. delete all captures- delete all the captured fingerprints/ID numbers stored in the device memory. scan and identify - scans the finger currently on the glass and searches for a match with the captures stored on the device. If a match is found it provides the capture's ID, if no match is found it provides a zero. scan and compare - scans the finger currently on the glass and compares it to the stored capture specified by the inserted ID value. If they match, the block provides a 1; if they don't match the block provides a zero. count number of IDs - provides the number of captures stored on your scanner. The Fingerprint Scanner can scan and store up to 1000 fingertip image captures. Your BlocklyProp project can compare a new scan to a specific capture by ID, or search all its captures for a match. Using the connections shown in the wiring image above, this example uses the Terminal to prompt a user to scan and assign an ID to their fingerprint, and then check that their fingerprint matches the assigned ID. Schematic for the Waveshare NEO-7M-C GPS module and Propeller microcontroller for the example functions below. Wiring may be different for the PAM-7Q or other GPS modules, please see their product guides for specifics. FLiP Wiring Alert! If using the Propeller FLiP module with a GPS module, use a 3-pin extension cable to provide some distance between the two modules to improve satellite reception and reduce interference. The GPS Data Output Blockly example retrieves longitude, latitude, speed, heading, elevation, and number of satellites from the GPS module. The units are converted to decimal degrees and displayed in the Blockly terminal. The underlying GPS library is compatible with NEMA-formatted GPS strings. This example features a large number of blocks. We recommend that you download the SVG file containing this pre-arranged program below and append it to your own project, rather than recreate it block-by-block. Want to learn more about downloading/uploading block files into BlocklyProp programs? Read the More BlocklyProp Features  section of the Getting Started with Blockly tutorial series. The basics are covered briefly below to get you started. Open BlocklyProp  and log in. Unzip the file you just downloaded and make a note of the file location. Start a new BlocklyProp project, or open an existing project you want to add these blocks to. Save your project, then click on the button with 3 parallel lines on it (furthest top-right on the page). Select the file you just unzipped, and click "Replace" to replace your current program with these blocks, or "Append" if you want to add the blocks to your project without deleting any already-existing blocks. These blocks may be used with the HMC5883L compass module (#29133, discontinued)  blocks and the Propeller Activity Board WX, Propeller FLiP module, and Other board types. Not available for Badge or Scribbler Robot board types. The Compass initialize block sets up the communication between the Propeller chip and the compass module. The Compass heading block stores the current unadjusted heading measured by the HMC5883L, in degrees as an integer, ranging from 0 to 359. Compatible with the Propeller Activity Board WX, Propeller FLiP, or Other board types. Not available for Badge or Scribbler Robot board types. These blocks are for using the MMA7455 3-axis accelerometer module (#28526, discontinued) . An acceleration meter (accelerometer) senses the forces that acceleration and gravity exert on a small mass inside the sensor. Think about that feeling of being pressed into your seat back as your car speeds up rapidly. Now think about the feeling of how gravity pulls you to the ground. Those are examples of the forces that an accelerometer senses and reports. The MMA7455 is a 3-axis accelerometer module that can measure up to +/- 8g of acceleration in 3 axes up to 250 times per second. The Accelerometer initialize block is used to set up the MMA7455 accelerometer module. Match each dropdown menu to the PRopeller I/O pin connected to the CS, DATA, and CLK pins on the accelerometer module. The Accelerometer store values block stores the sensor's x-axis, y-axis, and z-axis measurements in the chosen variable items. Propeller Activity Board WX, Propeller FLiP module, or Other board types. Propeller I/O pin availability will vary by board type. Not available for Badge or Scribbler Robot board types. These blocks are for using the MEMSIC2125 Dual-Axis Accelerometer (#28017) . The Memsic x acceleration block returns the approximate acceleration measured by the Memsic sensor. Acceleration is measured in terms of g (acceleration due to earth's gravity): a value of +/-1250 corresponds to approximately +/- 1 g.
Set the PIN dropdown to the Propeller I/O pin connected to the sensor’s Xout pin. The Memsic y acceleration block returns the approximate acceleration measured by the Memsic sensor. Acceleration is measured in terms of g (acceleration due to earth's gravity): a value of +/-1250 corresponds to approximately +/- 1 g.
Set the PIN dropdown to the Propeller I/O pin connected to the sensor’s Yout pin. The Memsic rotation block measures how much the sensor is rotated if it is held vertically (zero degrees is when the triangle on the Memsic sensor is pointed straight up. The sensor returns a measurement in degrees where 0 degrees is straight up, and 180 degrees is straight down. Set the PIN dropdowns to the Propeller I/O pin connected to the sensor’s Xout and Yout pins. The Memsic x tilt block returns a measurement of how much the sensor has tilted in the x (sideways) direction when the top of the sensor is level with the ground. The value returned is +/- 90 degrees. The Memsic y tilt block returns a measurement of how much the sensor has tilted in the x (front to back) direction when the top of the sensor is level with the ground. The value returned is +/- 90 degrees. The Memsic MX2125 Dual-axis Accelerometer is great for measuring tilt, vibration, rotation, and let’s not forget its namesake, acceleration. 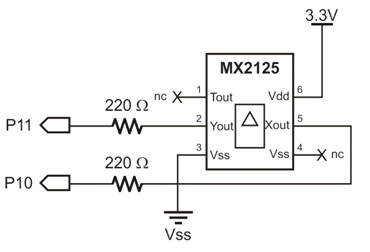 A few MX2125 project ideas might include a tilt video game controller, tilt robot controller, robot hill climbing sensor, and radio-controlled vehicle acceleration, speed, and position data logger. Using the connections shown in the wiring diagram above, this example will display X and Y tilt in the Terminal. 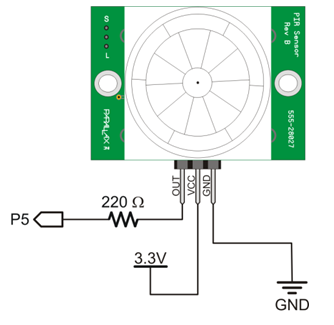 Compatible with the Propeller Activity Board WX, Propeller FLiP module, or Other board types. Propeller I/O pin availability will vary by board type. Not available for Badge or Scribbler Robot board types. New to PIR sensors? 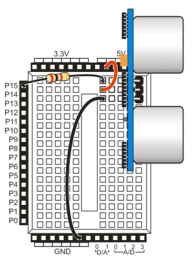 Click here to see an example schematic and quick Blockly program  to help you get started. The PIR sensor block returns a 0 (zero) if no motion is detected, and a 1 (one) if a motion is detected. The PIN dropdown must be set to the pin connected to PIR sensor’s out pin. A PIR Sensor can tell when something nearby moves. PIR stands for "Passive InfraRed". The sensor detects the pattern of infrared energy in its surroundings. If the pattern changes, the sensor outputs a high signal. The Propeller microcontroller only needs to monitor this signal with an I/O pin to know if something is moving around nearby. Using the connections shown in the wiring diagram above, this example will display the status of the PIR Sensor in the Terminal. A value of "1" indicates the sensor has been triggered (or set high), and a "0" is the resting (or low) state. It is typical for the sensor to be triggered when it is first powered up and getting an infrared reading from its environment. This may last up to 30 seconds. New to these sensors? 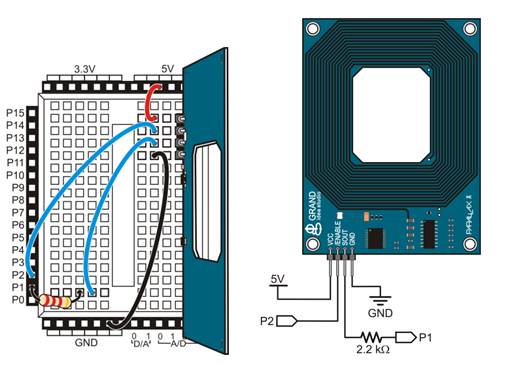 Click here to see an example schematic and quick Blockly program  to help you get started. The Ping))) distance block returns the distance to an object detected by the sensor, between 1 inch (3 cm) and 124 inches (315 cm) away. PIN dropdown: select the Propeller I/O pin connected to the sensor. Options will vary by board type. The Ping))) Ultrasonic Distance Sensor measures the roundtrip echo time of ultrasonic sound to determine how far away an object is. It can measure distances anywhere from 3 centimeters to 3 meters. In addition to being a great distance sensor for robots, it’s also useful for detecting people passing through doorways, viewing art exhibits, approaching holiday props, and more. Use a 2 k-ohm resistor (red-black-red) between the PING))) sensor's SIG pin and the Propeller I/O pin. Using the connections shown in the wiring diagram above, this example will display PING))) distance measurements in the Terminal Window. Use this block with the serial RFID Reader (#28140)  and the Propeller Activity Board WX, Propeller FLiP module, and Other board types. Not available for Badge or Scribbler Robot board types. RFID stands for Radio Frequency Identification. The Parallax RFID Reader Serial + Tag Sampler (#32390)  includes several unique RFID tags. Using the connections shown in the wiring diagram above, this example will display the unique identification number(s) of your RFID tag(s) in the Terminal. Please note this code is for the Serial RFID Reader, not the USB version. The Sony Remote value block returns a value detected by the IR receiver that indicated which button on the remote was pressed. If no button press was detected, this block provides a value of -1. An IR receiver can detect bursts of infrared light sent by a common remote controller (like for a television), and then output a pattern of high/low signals to a Propeller I/O pin. Using the connections shown in the wiring diagram above, this example displays the number of the button pressed on your remote in the Terminal. When no button is pressed, the Sony Remote value block sends a -1, and the message Button press = none will appear in the Terminal. These blocks are for Parallax's Sound Impact Sensor (#29132)  and the Propeller Activity Board WX, FLiP, or Other board types. Not available for Badge or Scribbler Robot board types. Use a 2.2 k-ohm resistor (red-red-red) between the Sound Impact Sensor's SIG pin and the Propeller I/O pin. Using the connections shown in the wiring diagram above, this example will display "Sound detected!" if the sensor detects one or more sound events, and "No sound detected." otherwise. These blocks are for the CM2302 Temperature & Humidity Sensor (#28059 ). It is also compatible with most DHT22 and AM2302 models. See the next page for a Getting Started tutorial, and/or watch the Tiny Tutorial video below. The Temp & Humidity read block triggers a supported sensor connected to the specified I/O pin to take and store temperature and relative humidity readings. Readings can be updated every 30 seconds. BlocklyProp uses integer math: The value returned by this block is 10 times the temperature or relative humidity measured by the sensor. To display the reading, use a print multiple block's floating point option for the Terminal, LCD, or OLED, and choose to divide the value by 10 on that block. See the wiring diagram and example code on the next page. BlocklyProp blocks for analog and pulse I/O. Block availability will vary by board type. The RC time (formerly RC charge/discharge) block sets the specified Propeller I/O pin to an input and reports how long it takes for an RC (resistor/capacitor) circuit to either charge or discharge across the pin's logic threshold. The value provided by the block is in microsecond units. This block must be used in conjunction with other blocks to charge (or discharge) the circuit before taking the measurement. Choose the Propeller I/O pin connected to the target circuit in the RC dropdown. I/O pin options will vary by board type. Choose which process time to measure (charge or discharge) from the RC dropdown. Or, click Other and insert a block that resolves to an I/O pin value. The RC time block is useful for circuits with a variable resistor or other means to affect current flow, including potentiometers, phototransistors, thermistors, and some pressure sensors. 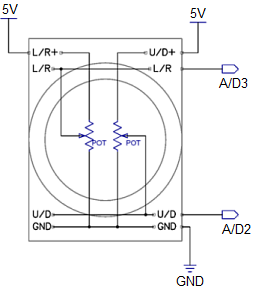 See Read a Potentiometer with RC Time  for an example of this block in action. The pulse-in block provides a value that represents a measurement of how long a pulse is in a low or high state in units of microseconds. The Propeller microcontroller begins measuring as soon as the PIN transitions into the state and stops and reports the measurement when it transitions out of the state. The pulse-out block sends a pulse out on the PIN set by the drop-down menu. The value block sets the width of the pulse output in microseconds. The count pulses block provides the number of pulses detected over a certain period of time. Choose the Propeller I/O pin to monitor for pulses in the dropdown; options will vary by board type. Set how long to monitor that pin for pulses by putting a number value, variable, or expression that resolves to a number in the duration (ms) field. For Propeller Activity Board WX, FLiP and Other board types. Not available for Badge or Scribbler Robot board types. Not available for Badge or Scribbler Robot board types. This block launches a processor automatically. Each subsequent instance of this block changes the PWM behavior as configured, but does not launch an additional processor. The PWM set block begins outputting a pulse-width modulated signal on the pin specified in the drop-down box with a duty cycle set by the value block is. For example, if the value block is set to 75, the PWM signal will be on 75% of the time and off 25% of the time. There are two PWM channels available on the Propeller microcontroller, so up to two PWM set blocks (one set to channel A and the other set to channel B) operating at one time. Setting the duty cycle to 0 (zero) turns the PWM signal off. 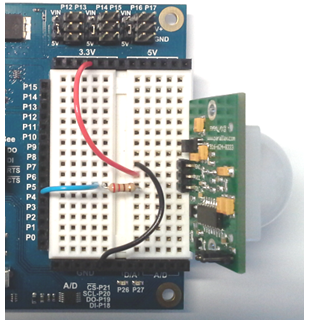 The PWM stop block stops the PWM process and frees up the resources it was using on the Propeller microcontroller. Use this block with the Parallax Standard Servo (#900-00005)  and the Propeller Activity Board WX, Propeller FLiP, S3 Robot, and Other board types. Not available for the Badge board type. Use this block with the Parallax Continuous Rotation Servo (#900-00008)  and the Activity Board WX, Propeller FLiP, and Other board types. Not available for Badge or Scribbler Robot board types. Use this block with the Parallax Feedback 360° High-Speed Servo (#900-00360)  and the Activity Board WX, Propeller FLiP, and Other board types. Not available for Badge or Scribbler Robot board types. These blocks ARE compatible with the original and WX versions of the Activity Board. See the BlocklyProp Robotics with the ActivityBot  tutorial for many examples of these blocks in use. ActivityBot: The original ActivityBot robot (#32500)  with external 3-wire encoders must be calibrated before use. This can be done using the ActivityBot calibrate block (below). The ActivityBot calibrate block is used by itself (it does not need the Robot initialize block). ActivityBot 360°: The ActivityBot 360° (#32600)  with 4-wire Feedback360° servos and no external encoders. This robot does not get calibrated. Arlo: for use with the Arlo Complete Robot System (#28966) , including the DHB-10 motor controller and the Propeller Activity Board WX. ActivityBot 360°: for use with the ActivityBot 360° robot (#32600)  which uses Feedback 360° servos but no external encoders. Calibration is recommended but optional before running other navigation programs. ActivityBot: for use with the ActivityBot robot (#32500)  which has external encoders. The ActivityBot MUST be calibrated before running other navigation programs. ActivityBot 360° (Parallaxy): for use with the Parallaxy Telepresence Robot (#32800) . The robot MUST be built according to these letsrobot.readme.io instructions  before calibration and use with the Parallaxy + Raspberry Pi + LetsRobot.tv system. Currently, the Load firmware block is ONLY for use with the Parallaxy Telepresence Robot (#32800)  . The code MUST be loaded to EEPROM. The block loads the Parallaxy firmware for interacting with a Raspberry Pi, which itself is programmed to work with LetsRobot.TV. For more information on Parallaxy software setup, see its letsrobot.readme.io pages here . Using most of the System blocks requires a good understanding of the Propeller chip's 8-core architecture. See the P8X32A Propeller Datasheet  or the Propeller Manua l for detailed information. The User Defined Code block requires some understanding of Propeller C programming. See the Propeller C Tutorials  as a resource. Each Propeller core has its own set of registers; this block interacts with the core executing the block code. See the Cog RAM Special Purpose Registers in the P8X32A Propeller Datasheet  or the Propeller Manua l for detailed information on these registers. This block appears in the System menu for the Other board type. It appears in the Values menu for the Activity Board, FLiP, and Badge board types. It is not available for the S3. For a tutorial using this block, see the Precision Timing with the Propeller  tutorial. It is helpful to have an understanding of Propeller C if you wish to use this block. Click here  to learn more about Propeller C.
Included libraries must be available in the BlocklyProp branch of SimpleLibraries , as those are the only libraries BlocklyProp can access.